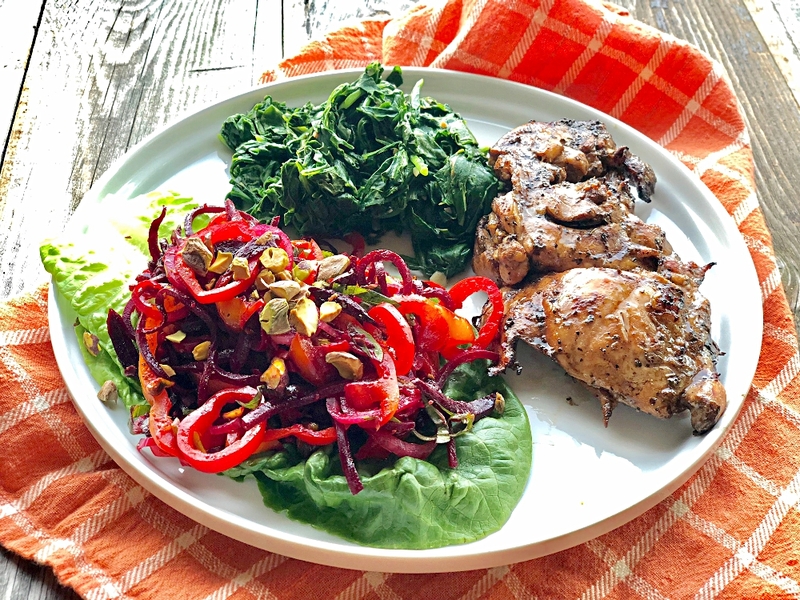 Want to make a salad that screams summer and makes use of the fresh garden produce that’s sure to come? 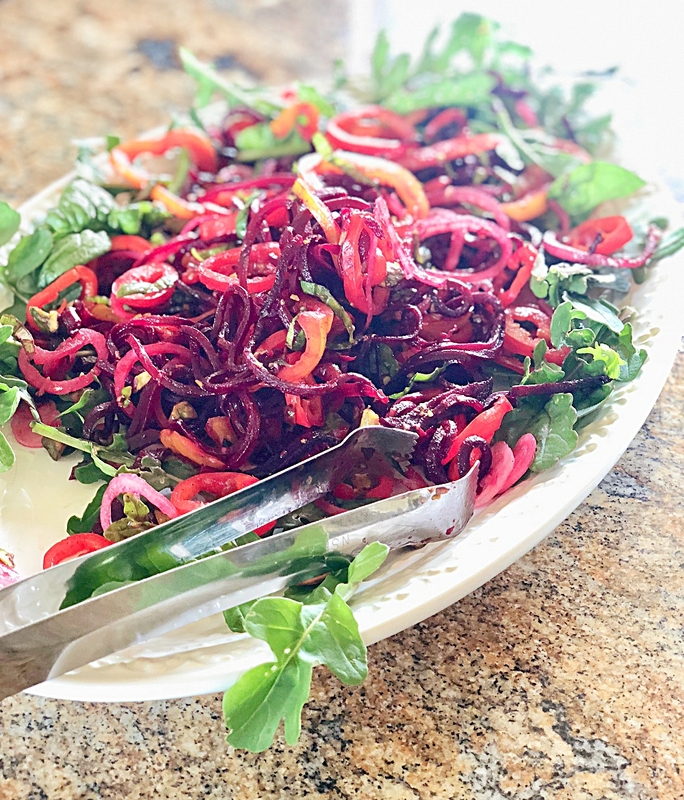 Pistachio Basil Beet Salad illumines the table with bright color and flavor and it’s so simple to make. By layering a mix of roasted and raw veggies, complimentary flavors and textures are brought to the salad party. 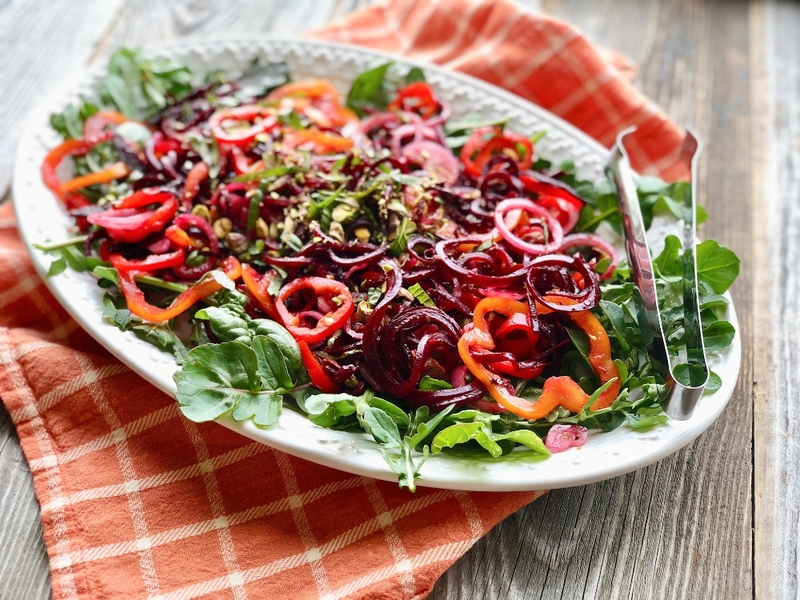 The true vegetables flavors are highlighted with a simple lemon dressing that lightens and brightens this vibrant salad combo. First things first, I preheated the oven and lined a rimmed baking sheet with parchment paper. Not a requirement, but it does make clean up easier. 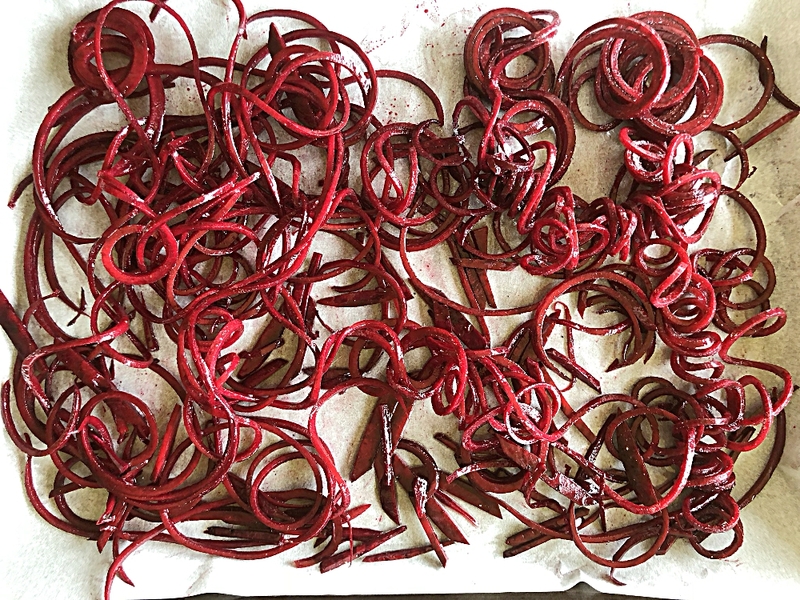 Then, I spiralized the beets on the small noodle setting…the one that makes it like spaghetti. I use a Paderno spiralizer, available on amazon. 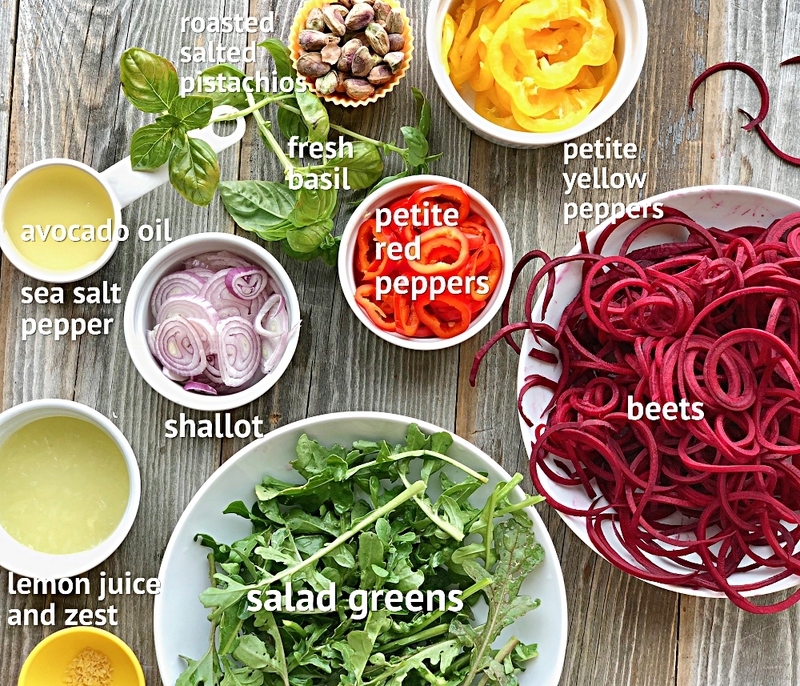 Roast the beet noodles at 425 for 10 minutes and while they’re roasting, prep the other veggies and make the dressing. 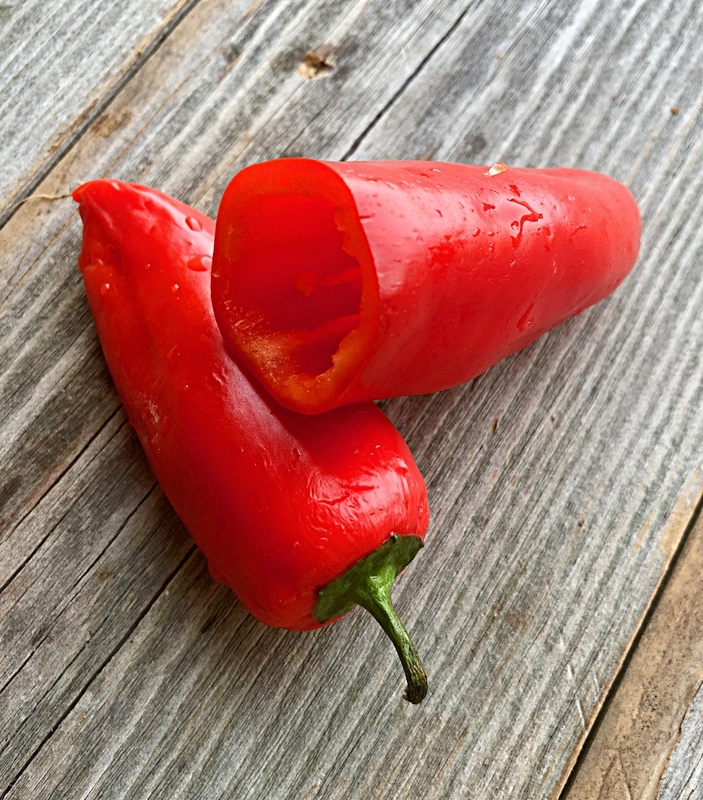 The small peppers that you get in a package in an assortment of colors came in handy for this recipe because I wanted the slices to be bite sized. They proved to be just the right size. The seeds were removed by slicing off the top part and cutting out the seedy core. I’ve been perfecting this recipe for a while now and the first few times I made this, it was served on the plate without greens. It’s best on neutral flavored salad greens not on arugula, as shown here, FYI. If the birds weren’t slowly mowing down our tender lettuce greens I would have used them for this salad. (The hubs made netted tents for most of the garden greens so now they’re finally growing). I wonder why the birds don’t go after arugula? Hmmm? Back to the salad, serve it on a white plate and salad greens for the best visual appeal and dive in. I served it with grilled chicken and sautéed garden fresh broccoli rabe. If your people don’t care for beets, this would be a good recipe to try on them. It’s very light and minimizes the earthy flavor of the red root which is a common complaint among beet haters. Please make it and tell me how you liked it. In cooking class news, the fermenting workshop was well attended with wonderful people all excited to start preserving this season’s harvest with local food. If you and a few friends would like a private fermenting workshop, I am available this summer to do those. Just e-mail me at cookwithamyg@gmail.com and we can arrange it. Other cooking classes will resume in the fall. Toss trimmed beet noodles on parchment paper with 1 tablespoon of avocado oil (you can sub in olive oil), sea salt and pepper. Spread noodles out in a thin layer and roast for 10 minutes. Remove when done and let cool. While beets are roasting prep all other veggies and make dressing. Once beets are cool enough to handle, place beets, peppers, and sliced shallots in a medium bowl and toss gently together. Add 4 tablespoons of dressing, half of the basil and pistachios and toss to combine. Line a serving dish with salad greens and arrange veggies over greens. Top with remaining basil and pistachios for garnish. Serve with leftover dressing to pass around. Yummy! And hellooooo summer. Just made this for our thanksgiving feast and it was a hit! It offered a great balance to the heavy dishes. I’m so glad it was a hit! Thanks for letting me know! I always like adding something fresh to the Thanksgiving table for the same reason.